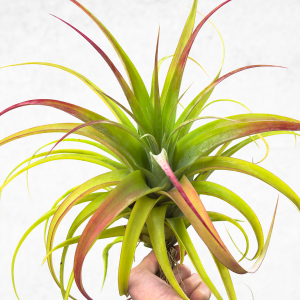 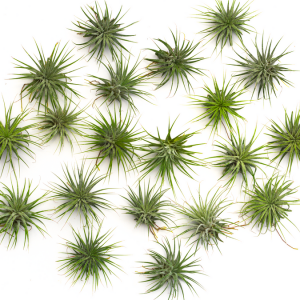 View cart “50 Wholesale Small Air Plant Bulk Pack” has been added to your cart. 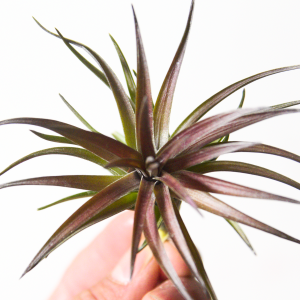 Tillandsia Aeranthos Bronze Clump is very hardy and has a strong clumping habit. 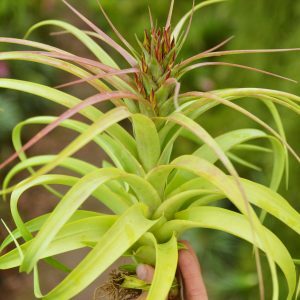 Each clump comes with 5-8 plants that can be easily pulled apart.This air plant has a light caramel color hence the “Bronze.” Produces vibrant pink inflorescence with purple flowers when in bloom. 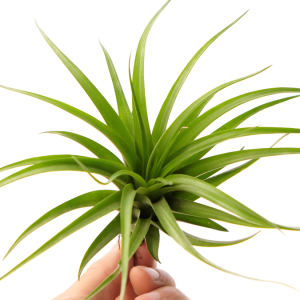 Each plant can grow reach up to 5 inches in length. 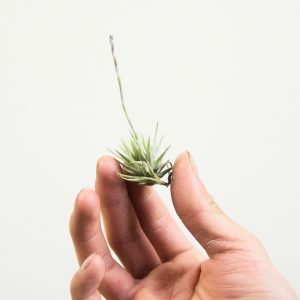 This size of clumps makes perfect terrarium air plants. 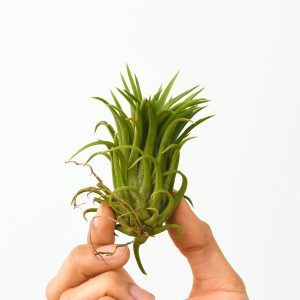 Tillandsia Ionantha Selecta is a cultivar of Ionantha selected for its thick dark green leaves and particularly symmetrical shape. 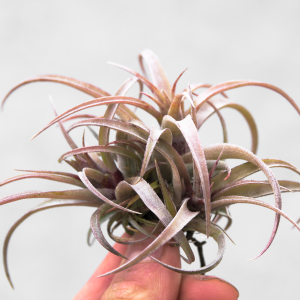 Resembles a smaller version of Ionantha Big Boy. 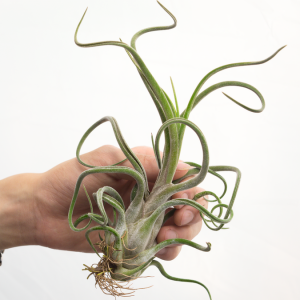 Depending on its growth environment it may either take on a closed form or open form. 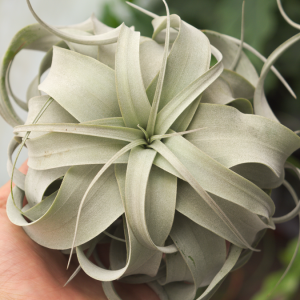 The silvery green leaves of Tillandsia Gardneri curl back from the middle to form a beautiful fountain shape. 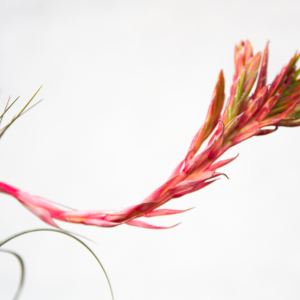 The leaves have a papery appearance. 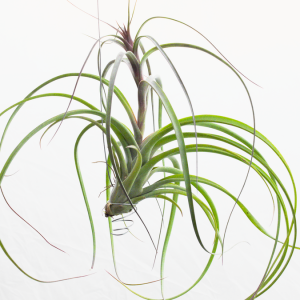 Despite its delicate appearance, Gardneri is a very hardy air plant. 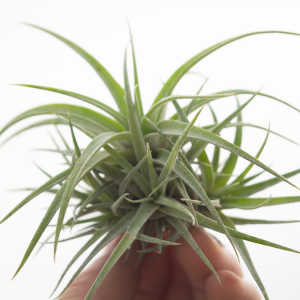 Tillandsia Loliacea is a miniature air plant species that grows only up to about 1 inch tall. 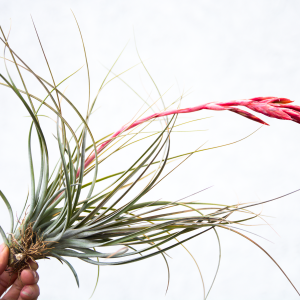 Tillandsia Loliacea is native to the semi dry climates of Bolivia and Brazil. 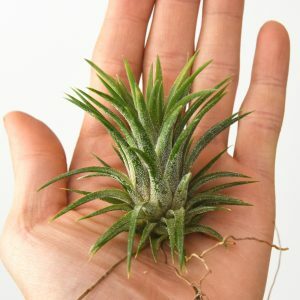 The foliage is thick and stiff with a visible coat of trichomes. 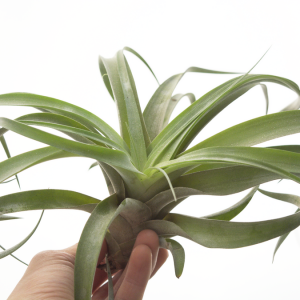 Has a strong clumping tendency and produces many pups. 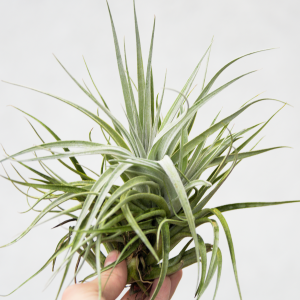 As its name suggests, Tillandsia Funckiana is a funky-looking air plant in every way. 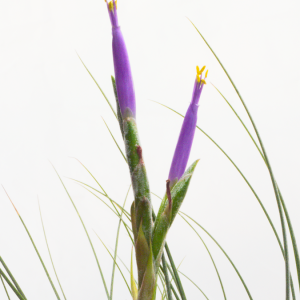 These needly plants form bright red blossoms at the center when in bloom. 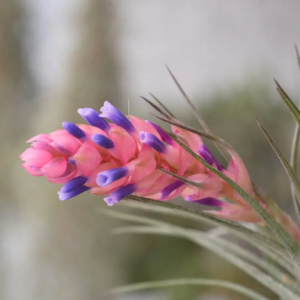 The plant you receive may not be blooming at the moment. 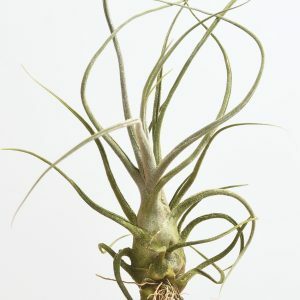 A rare air plant in cultivation. 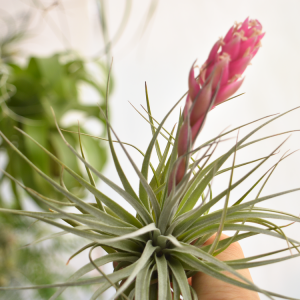 Stricta v. Compacts produces giant pink blossoms when in bloom. 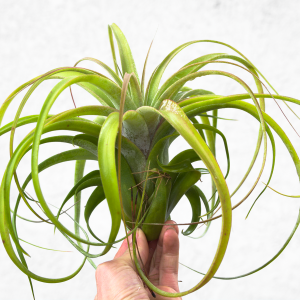 The emerald green leaves grow densely around the center to give this air plant its “compact” look. 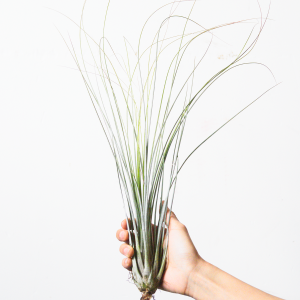 This Stricta v. Compacts looks great in a terrarium or wire hanger. 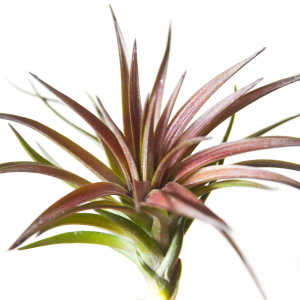 Tillandsia Stricta Stiff Purple has a dark purple tinge on the edges and tips of the leaves. 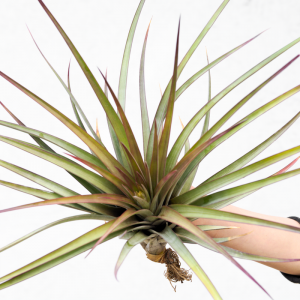 Keep in a bright location for the plant to continue to look purple. 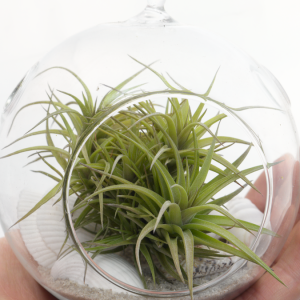 Great size for terrariums and smaller planters. 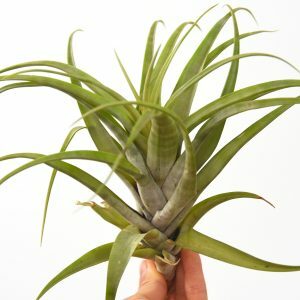 Very easy to grow! 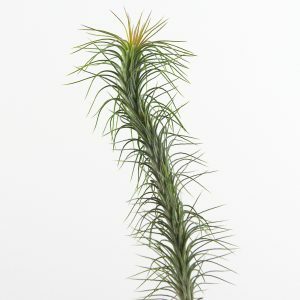 Tillandsia Ionantha Albino (Ionantha Druid) is a lush green ionantha with thick succulent-like leaves and visible trichomes. 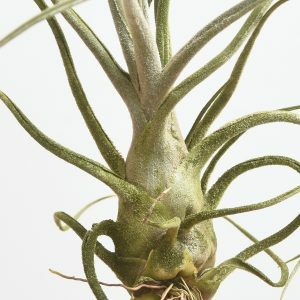 Grows with a symmetrical leaf pattern and looks nice in terrariums. 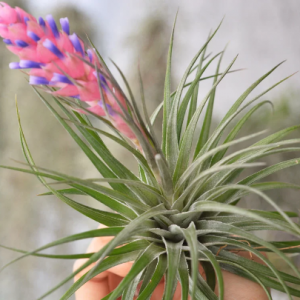 When flowering, it produces unique white blossoms. 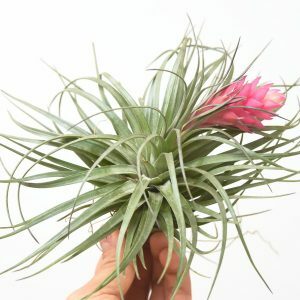 Usually forms a clump of a few air plants after flowering. 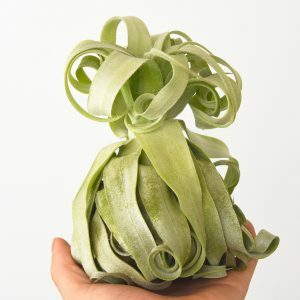 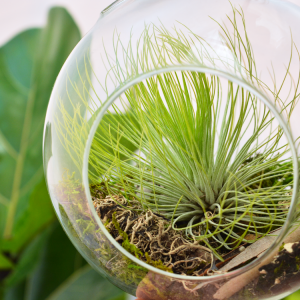 This bulbous air plant is truly one-of-a-kind. 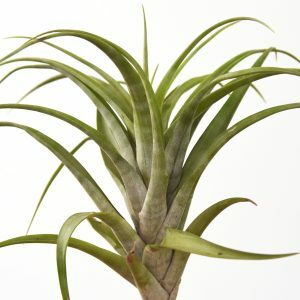 I have these Seleriana plants in both large and small sizes. 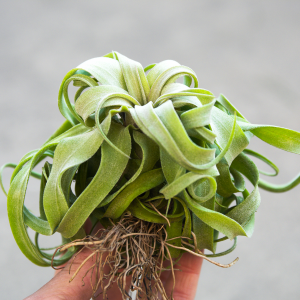 The thick and fuzzy leaves curl up to form a giant pseudobulb on the bottom. 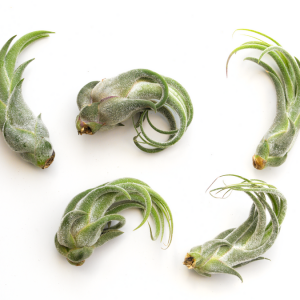 Hang up your Seleriana or display it in a cute planter on the desk. 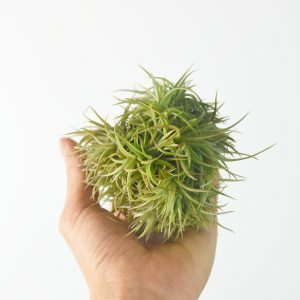 This cool air plant makes a great gift for the plant and nature lovers. 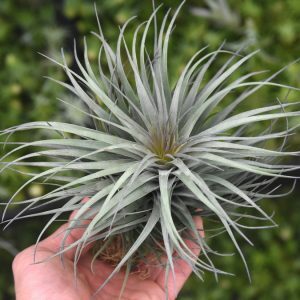 Tillandsia Flexuosa (Twisted air plant) is a beautiful species native to Florida, West Indies, and Panama, Venezuela, Colombia. 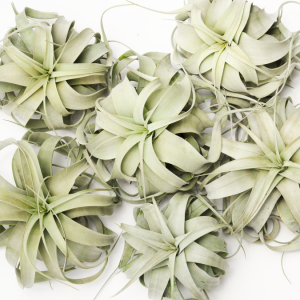 It has lush green leaves with alternating bands of white on the outside. 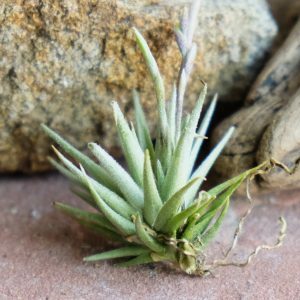 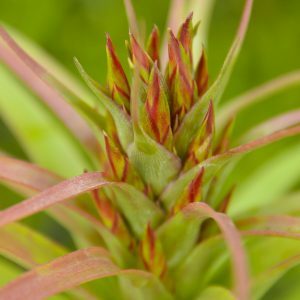 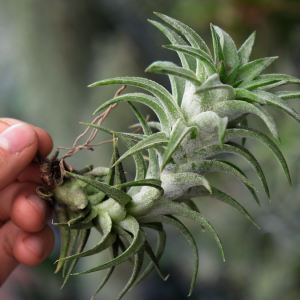 As its name suggests, TIllandsia Flexuosa has leaves that will twist in opposite directions once it matures. 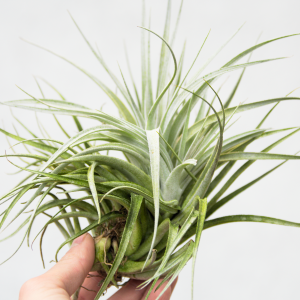 Like all of our tillandsias, our tillandsia Flexuosas are greenhouse grown and not collected from the wild. 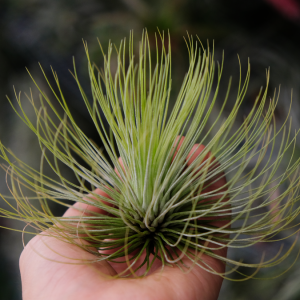 This Jalisco Monticola air plant is a spectacle of nature! 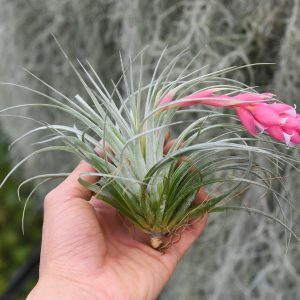 Tillandsia Jalisco Monticola can grow up to 24″! 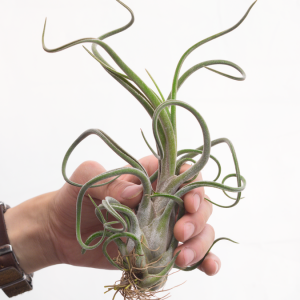 These extra large Jalisco Monticola air plants are currently ~20″ wide. 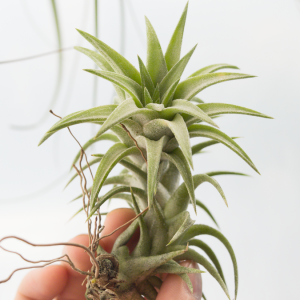 They have stiff and structured leaves. 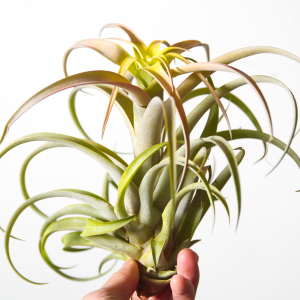 A rare statement piece. 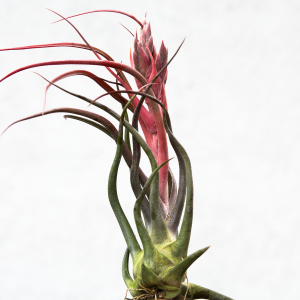 Tillandsia Stricta Iridescent is a beautiful air plant tinges of lilac and maroon. 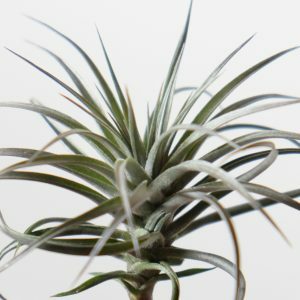 The stiff foliage grows densely around the center to form a symmetrical fountain shape. 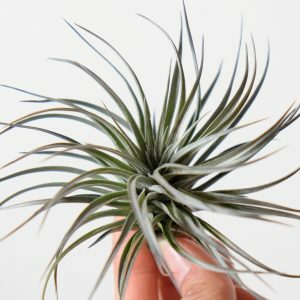 Looks amazing by itself or on a hanging air planter! 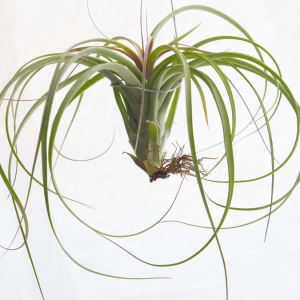 Tillandsia Kruseana is a large-form air plant that grows to more than 12″ across and 10″ tall. 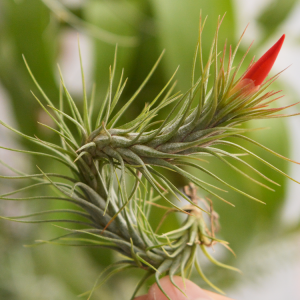 When blooming, the spike turns maroon and the entire plant gains a slight shade of red. 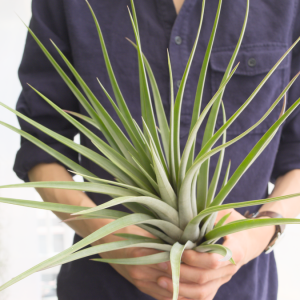 The leaves are stiff and upright. 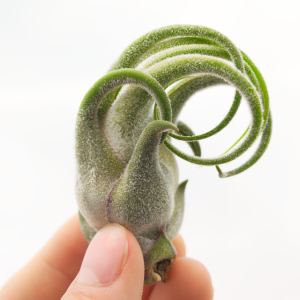 Currently in bud. 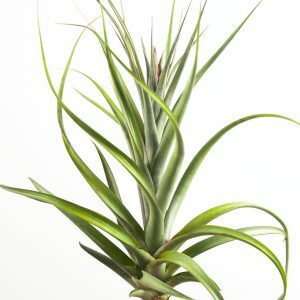 Tillandsia Xerographica x Brachycaulos clump is an air plant cluster of the hybrid between Tilllandsia Xerographica and Tillandsia Brachycaulos. 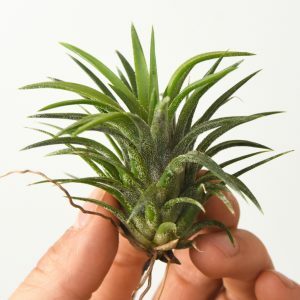 Each clump comes with 2-3 larger plants and a few baby pups. 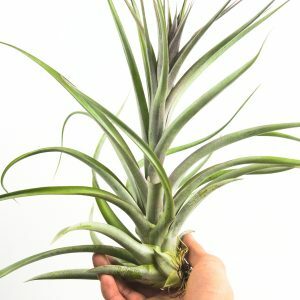 Each pup will form large plants with beautiful recurving leaves similar to that of a Xerographica when mature. 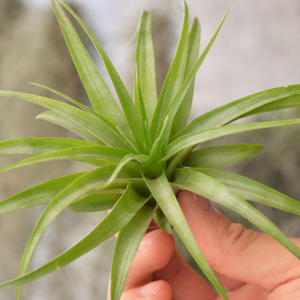 See last pictures for the mature plants. 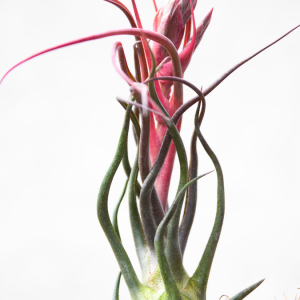 Currently blushing pink. 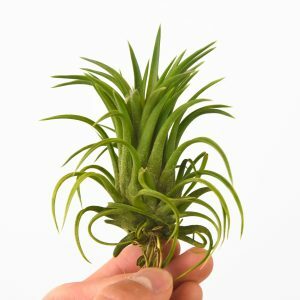 Each mother plant clump comes with about 3-5 heads.